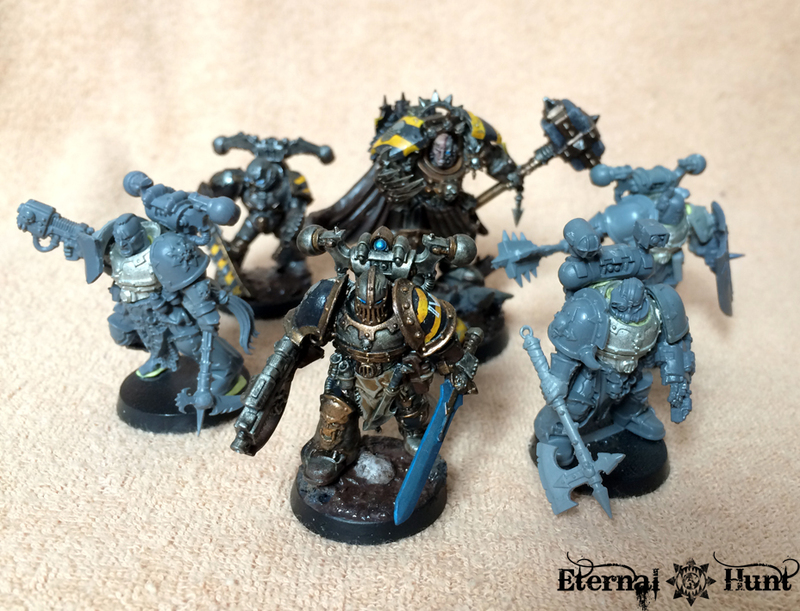 The idea behind this Killteam is to build the models to be immediately recognisable as Iron Warriors, so I thought about which visual archetypes I wanted to include. 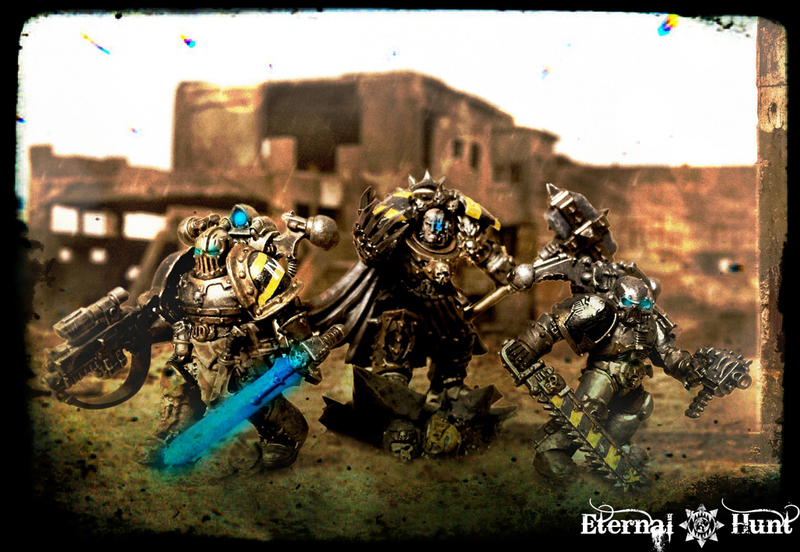 The Iron Warriors, to me, are characterised by their cold efficiency and bitterness: a reliance on superior strategy and wargear and the will to sacrifice as many lives as it will take to vanquish the foe. I wanted the models to exude a sense of cold and sinister brutality, a menace born of the disregard for human lives. I’ll let you be the judge as to whether or not I have succeeded. 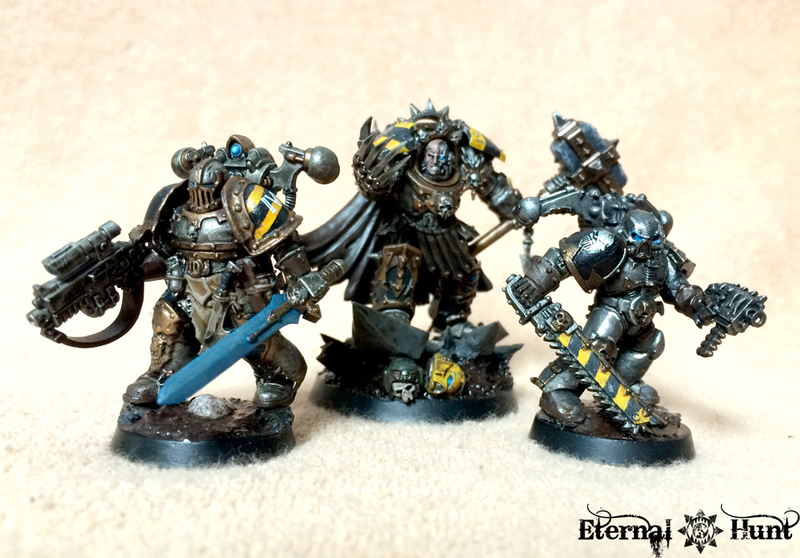 The first is the batch of Dark Vengeance Chosen models kindly given to me by Commissar Molotov: The Chosen had just the amount of bulk and presence I needed to make my Iron Warriors look like actual, bitter veterans of the Long War instead of just some more CSM flunkies. So many thanks again to Mol for his generosity! While certainly nothing special by today’s standard, I didn’t simply want to leave this guy behind, so I decided to give him a bit of a facelift. 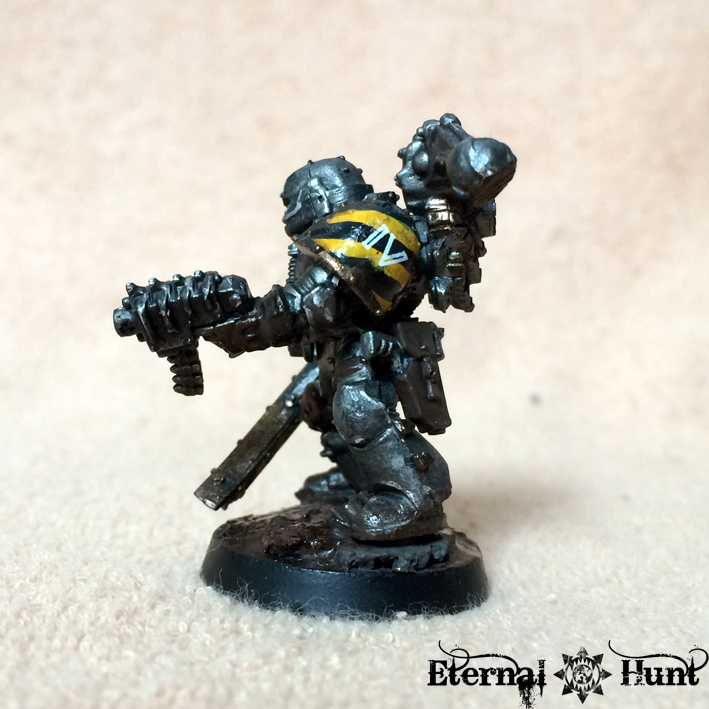 The clunky icon was replaced with a DV Chosen bolter. And while I didn’t completely repaint the model, I used it to test some new painting techniques of mine, especially on the hazard stripes. Having this model as a test piece allowed me to figure out a way to include the legion number on one of the pauldrons (by using a cut out and inverted Cadian decal, incidentally). All in all, I think the model makes for an excellent IW squad leader, if I do say so myself. There’s something dark and brooding about him that seems really fitting! And although it seems a bit blasphemous that I had to cut up a Skullcrusher helmet to build the model, it’s probably the best possible helmet for an IW champion — many thanks to Oldschoolsoviet for giving me this idea! 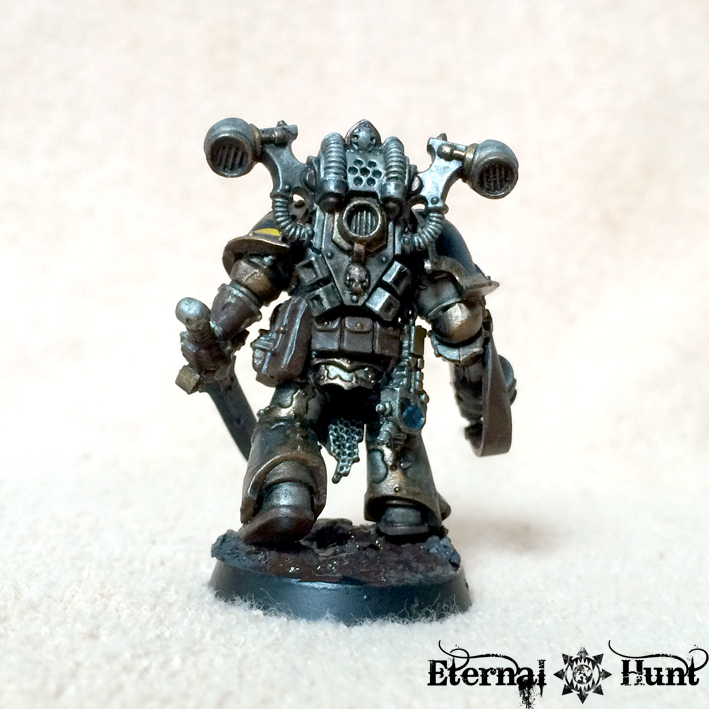 On this model, the biggest challenge was to maintain the balance between having the character look like a Chaos Space Marine (and an Iron Warrior, at that), while also seeming businesslike enough to work as an Apothecary. 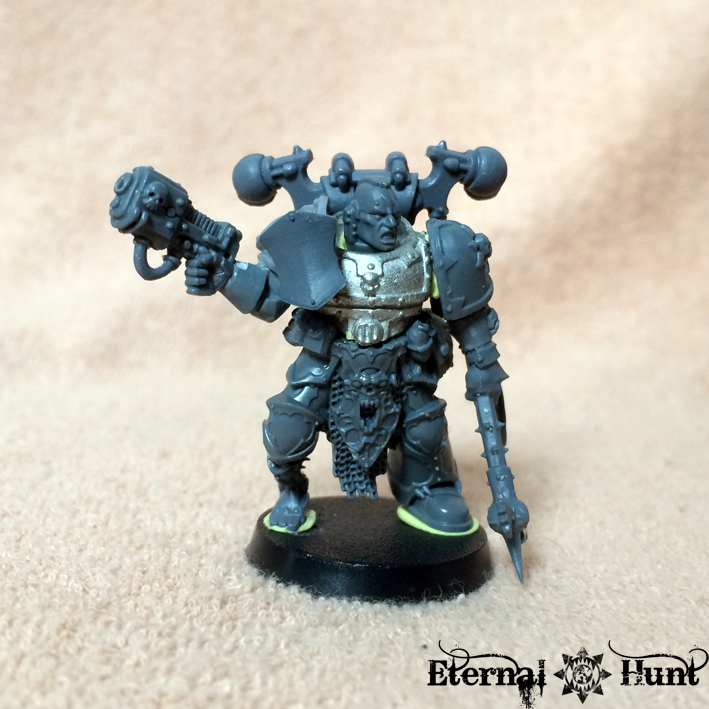 In the end, the bit that really makes the conversion is a bare, augmented head from the Skitarii Ranger/Vanguard kit. It just fits so well, don’t you think? 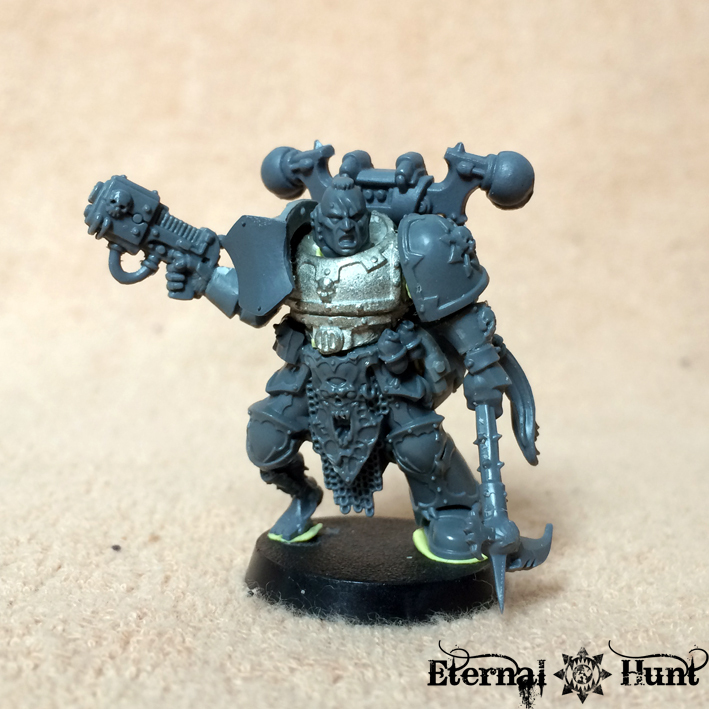 By the way, the first version of the model was carrying a plasma pistol, rather than an axe, but I felt the axe added a subtle executioner look to the character, and that’s certainly an aspect of his role as an Apothecary, don’t you think? As you can see, some WFB chaos bitz proved to be a great help here, allowing me to arm the Breacher with a massive mace and boarding shield. 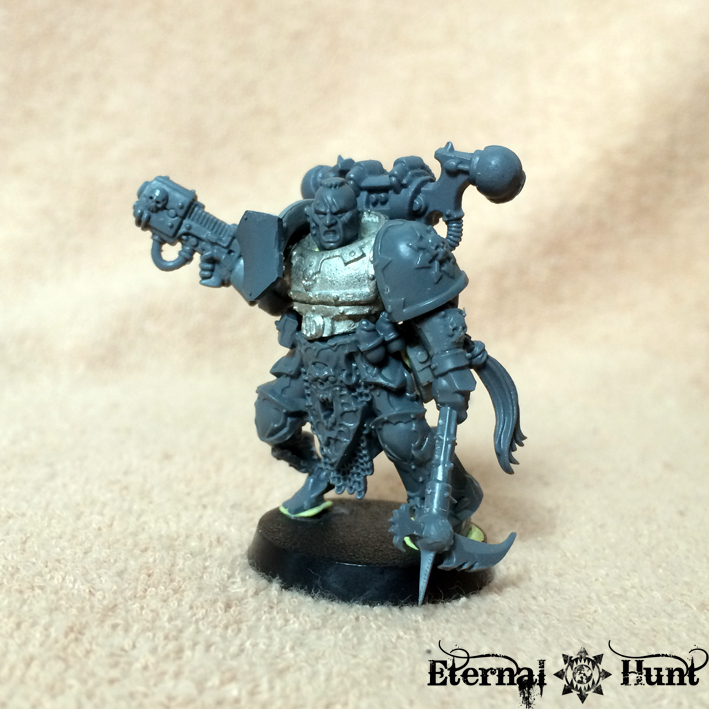 I also added a holstered bolter, though — this guy is a crazy prepared Iron Warrior, after all. My favourite detail, apart from the pose, is the helmet: I really enjoy the “expressionless”, utterly inhuman look of that particular helmet from the WFB Chaos chariot crew, and I added some tech-y gubbins to the helmet to make it look slightly more modern. 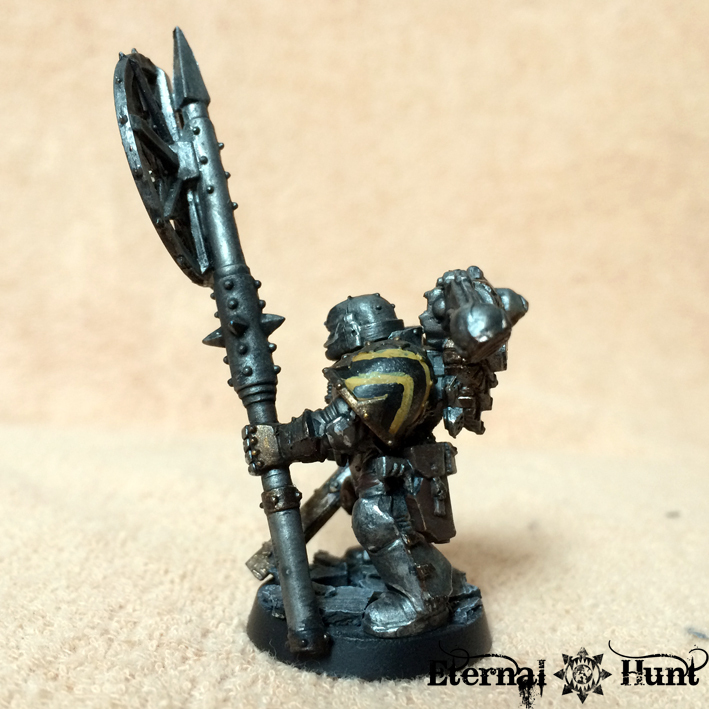 The entrenching tool is a weapon from the WFB Skaven Stormvermin kit, and easily one of my favourite plastic weapons, simply because it’s so vicious-looking! I have wanted to use this particular part for quite a while, and this model turned out to be the perfect occasion. As for the bionic limb, I settled on replacing the model’s right leg, mostly because I used Kranon’s legs, and the right leg is only partially formed anyway (because the model’s cape normally obscures it). Now I do realise that some may see my design choice as a bit of a divisive feature, because I went for a – fairly thin – Skitarii leg. 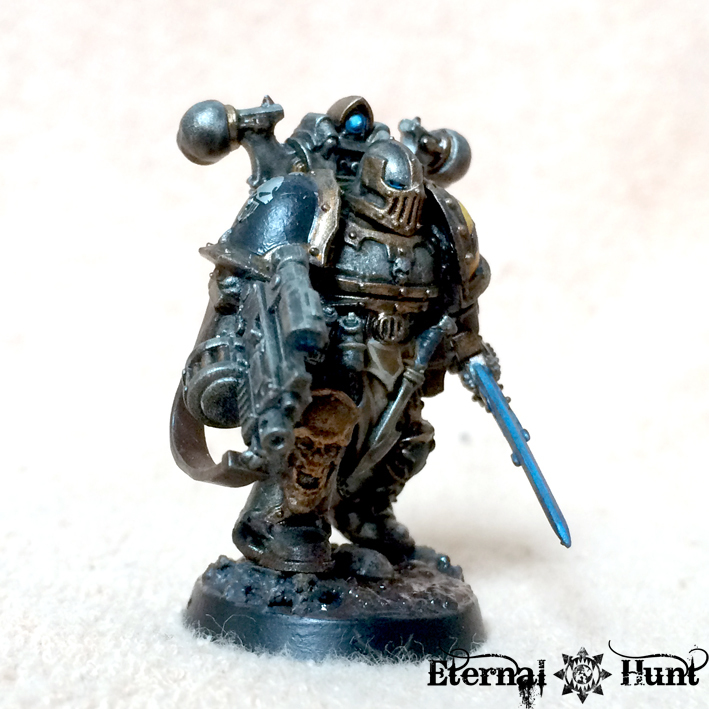 However, this was a rather conscious choice, because I wanted to achieve a slightly peg-legged look: Seeing how the entire armour will be silver, a leg painted in silver wouldn’t stand out too much, which is why I went for the Skitarii part. 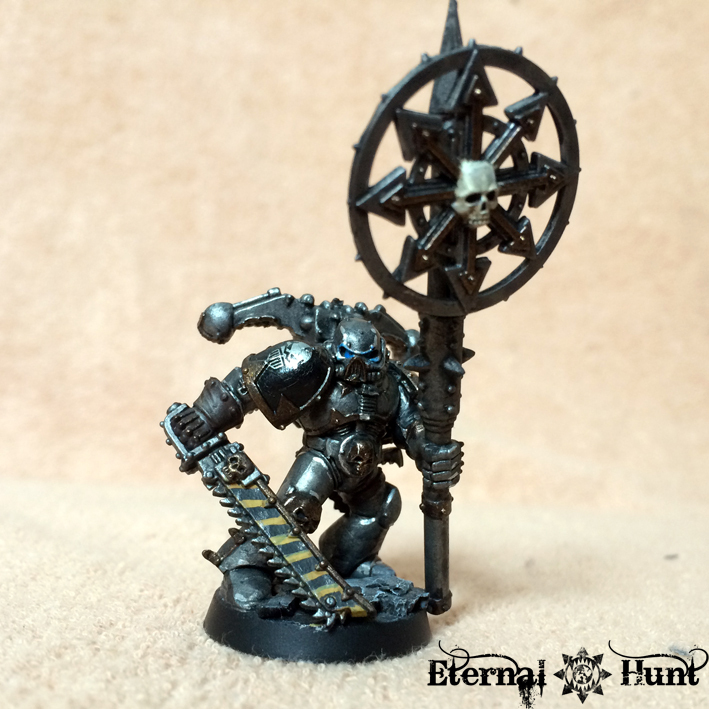 Plus I was also inspired by a scene in Graham McNeill’s Storm of Iron, where a veteran Iron Warrior actually experiences difficulties due to his leg replacement — I wanted the leg to be both at once: a highly sophisticated replacement, but also a possible weakness, and I think the Skitarii leg does a great job embodying that particular duality. 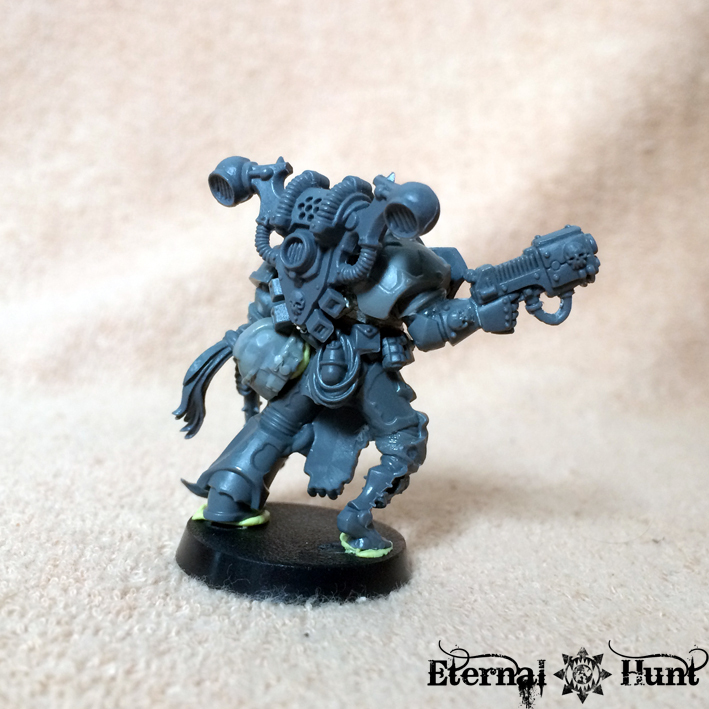 So far for the finished conversions, but are there any more plans for this particular Killteam? Right now, I think there will be two more members: A heavy weapons specialist (I am leaning towards arming him with a rocket launcher) will be one of the additional members. 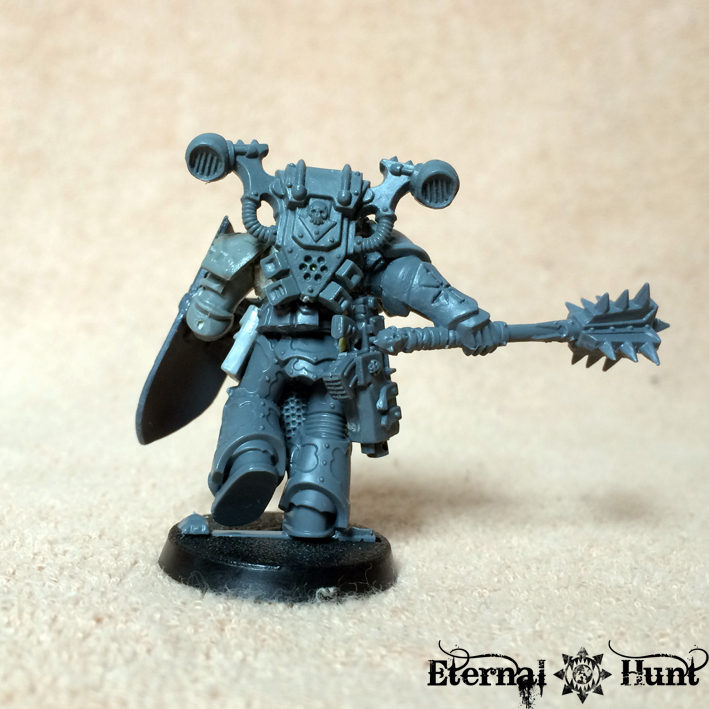 I already have most of the bitz I’ll need for the conversion. Like I said, this has been a very rewarding mini-project so far, and I think I have learned quite a few days that will ultimately also benefit my World Eaters. 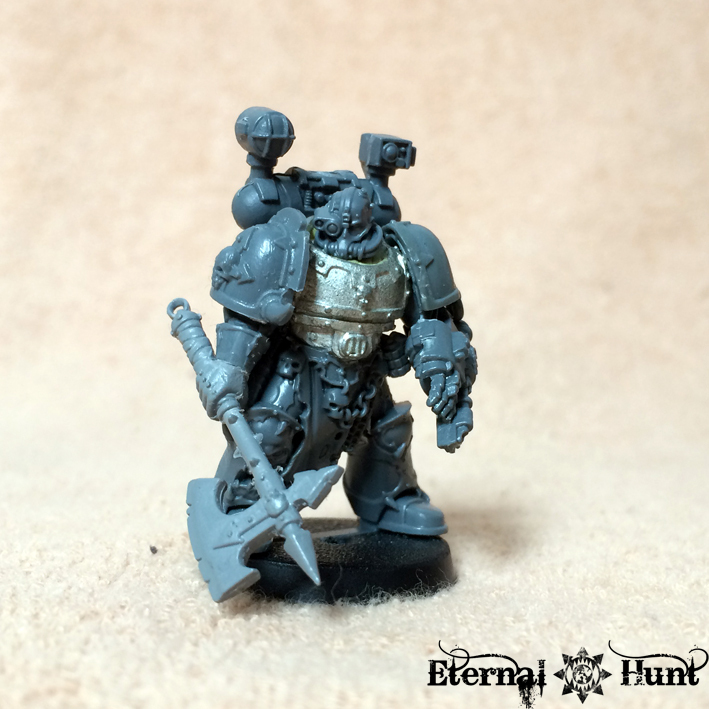 This entry was posted on May 27, 2015 at 09:00 and is filed under 40k, Chaos, Conversions, paintjob, WIP with tags 40k, chaos, chaos space marines, conversion, Iron Warriors, killteam, kitbash, paintjob. You can follow any responses to this entry through the RSS 2.0 feed. You can leave a response, or trackback from your own site. 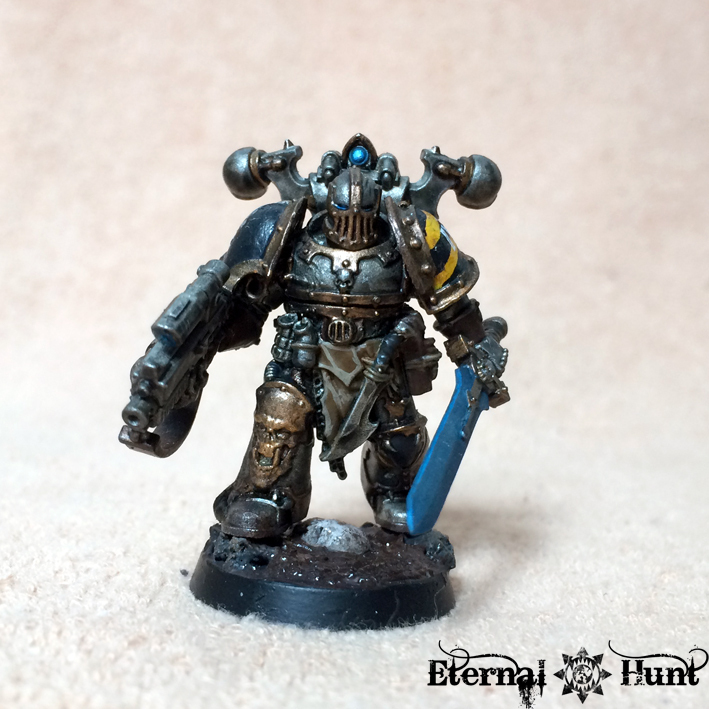 I think Iron Warriors suit you – a nice break from the khorne-boys and you can always ally them to the main force. 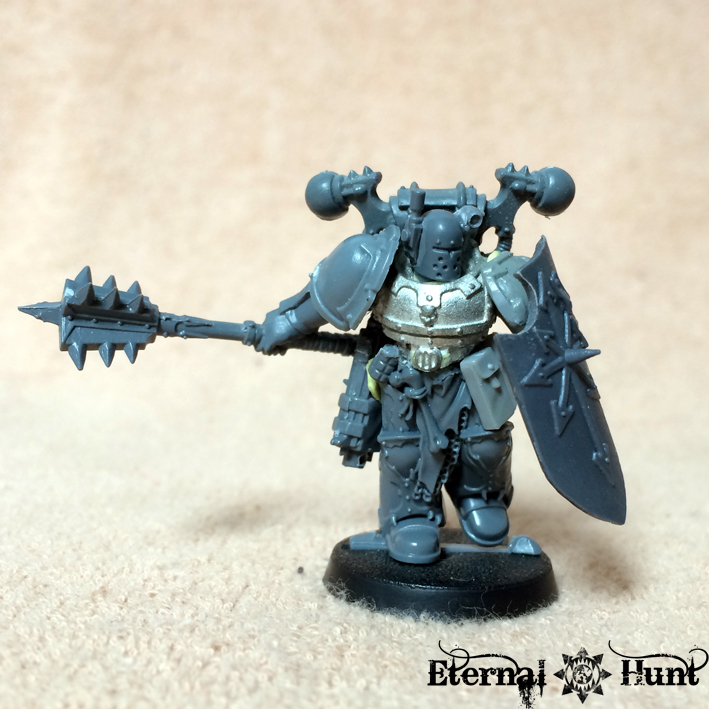 I really like the use of chosen legs – it gives them some extra bulk and seems to put them somewhere between standard marines and truescale, which is quite a nice size for marines. 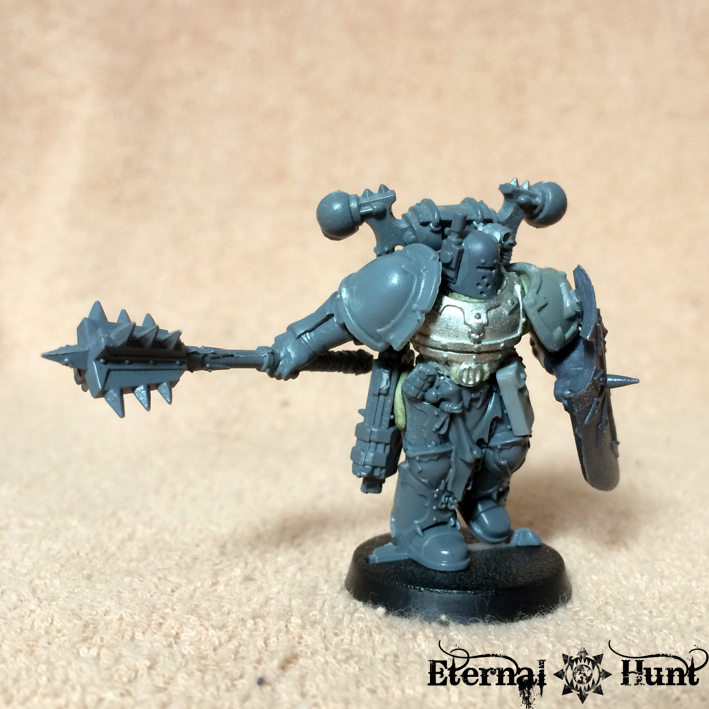 The champion turned out great and the apothecary is amazing – he looks like a Kari-build which is a huge compliment in my book). -The trenchers bionic leg seems way too feeble – especially when he´s leaning on it like that. It looks like it´s about to break under his own weight. 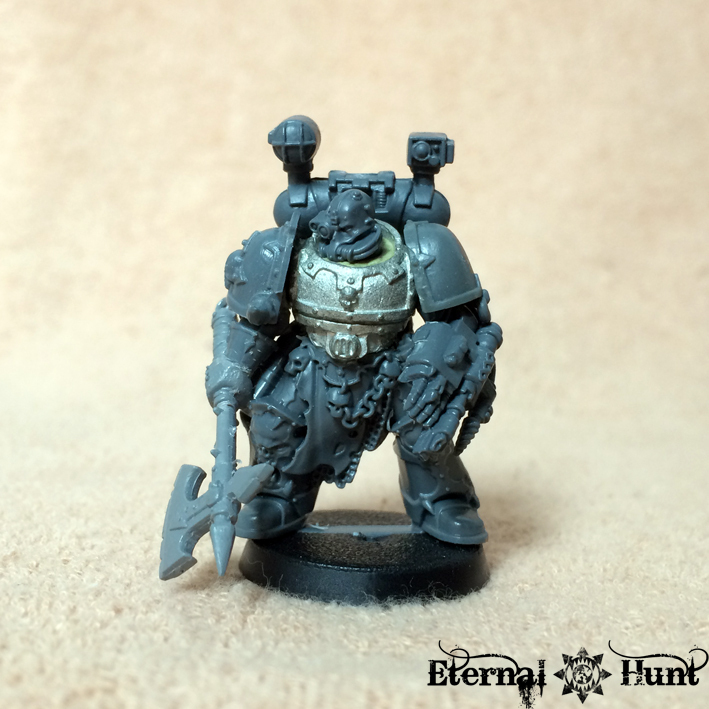 – You really should put these guys on 32 mm bases – they´re to cool and too bulky for 25 mm. Thanks a lot, Johan! That is very nice of you to say! 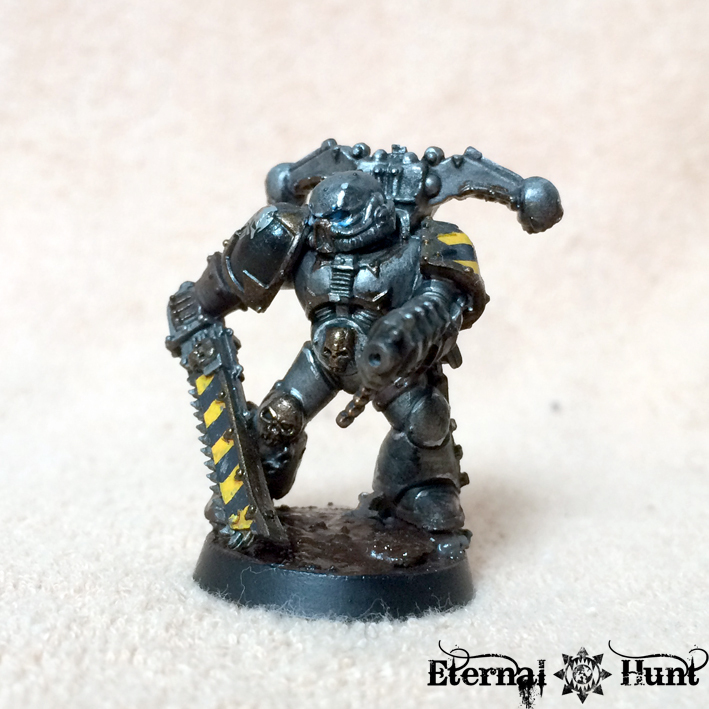 Oh, and I never really got the 32mm base craze. I see why it’s nice to have more room for the model, but maybe I am just too oldskool (and certainly too lazy to rebase my entire collection, that much is for sure 😉 ). Really characterful stuff! My favorite is the apothcary, the skitarri head really is an inspired choice. He looks like a real butcher!!! The champion is also especially menacing with a great pose…. I don’t want to be overly critical but the one thing that struck me is that the blue colour for his power sword doesn’t really suit?….maybe a yellowing green colum or perhaps a purple? The champion and apocathary are amazing. I just love them. That apothecary is epic! And I actually like the peg-leg, a bit off balance sure, but adds a good deal of character to him. Your metals look nice and grimy as well. Peg-leg Pirate Iron Warrior! They are looking good and I can understand the need to to have a change of pace now and then. Much less red to paint for starters. So cool. Love the breacher. The movement in the model is great. Long time follower, first time commenting. I love the look you have gotten out of them, very well executed. The only gripe I have is the leg on the trencher, it seems very small compared to the rest of the model. Love the apothicary btw. Also, Finally, you need to inform me of how you get your transfer decals to not come out as glossy as mine do. I have always tried and failed at good decal work to the point where I want to practice some freehand, but yours are damn near perfect. Thanks Kraut! Thanks, Thorn! That is very nice of you to say! Regarding the bionic leg, see my reply to Jeff Vader above about why I like that particular look. Can’t wait to see how you finish those models out, and I look forward to it! 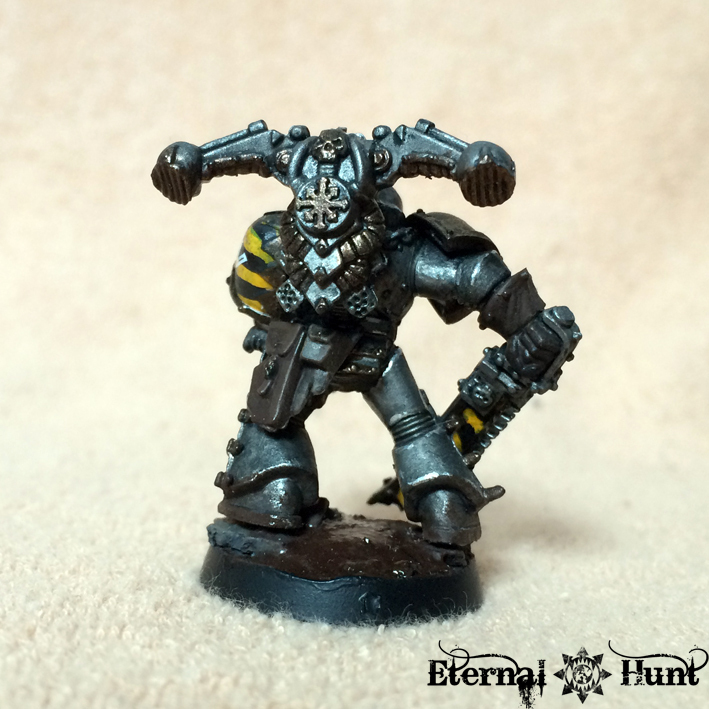 Now that I’m in the final parts of the final few of my own “legacy” Iron Warriors, I’m thinking about new builds. Your Champion and Apothecary have particularly stood out for me since I first saw them. So I’m wondering if you’d mind me drawing some pretty specific inspiration from those two, and also if you would be able to let me know a parts list for that pair? 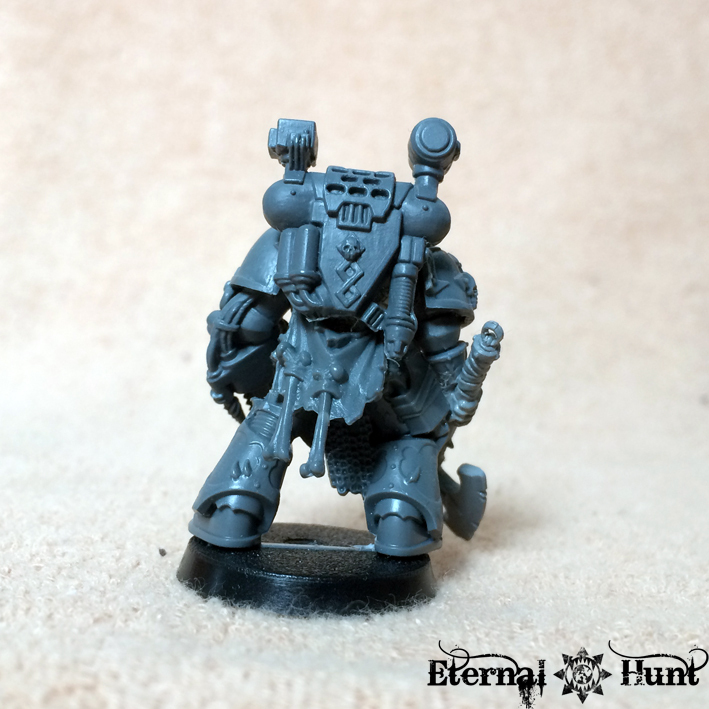 Particularly: Legs on both, Bolter and backpack sensor-bit on the champion. 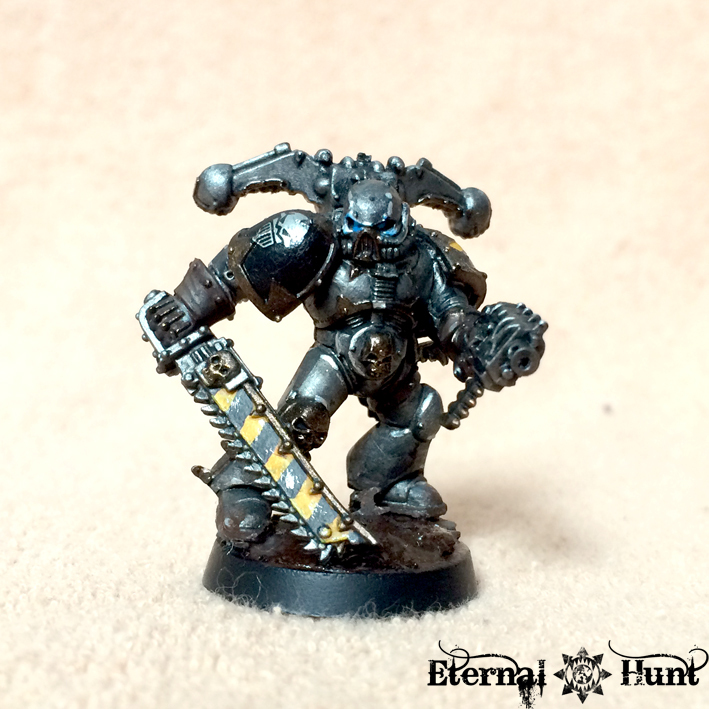 As for the bitz, both models are based on a torso from the Iron Warriors conversion kit (still available from GW) and legs from the Dark Vengeance Chosen. This leads to a nice, massive look that is almost true scale-ish but still looks right next to “regular” models. 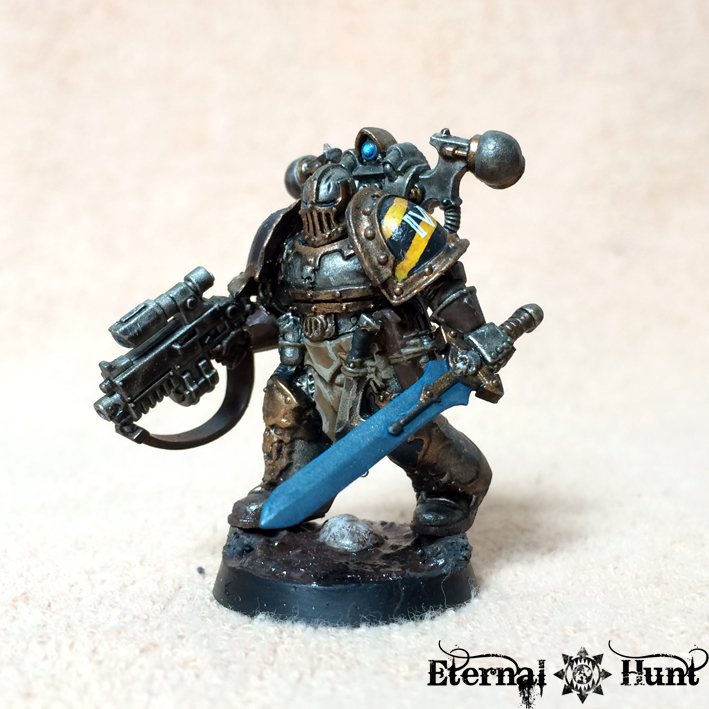 Apart from that, they mostly use a mix of Space Marine, Chaos Space Marine and warriors of chaos bitz: The bolter on the champ came from the Sternguard kit, IIRC, while the sensor bit on his backpack was originally one of the small, shoulder-mounted sensors from the Tempestus Scions. 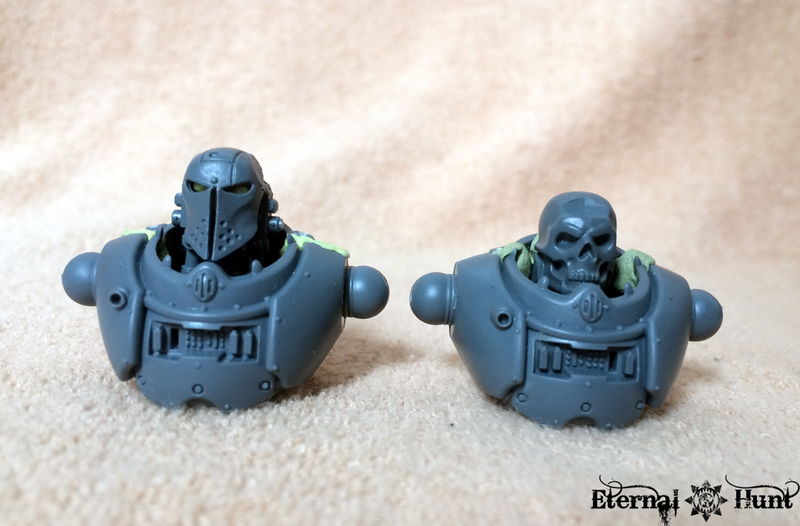 Other noteworthy bitz include the head of a WFB Skullcrusher on the champ and the Narthecium arm and backpack from a Space Marine Apothecary and a head from the Skitarii Vanguard/Ranger kit on the Apothecary. If you need a more thorough bitz list, don’t hesitate to ask! Awesome thanks! – I recognised the torsos. I think I have some left. Legs from DV… that makes sense. I’ll find and chop some of those guys up. 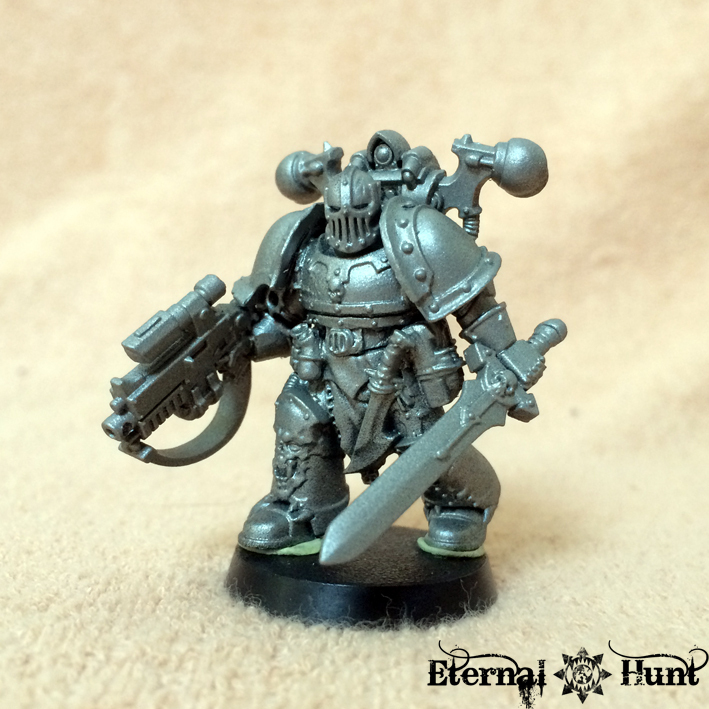 I found that same sternguard bolter a few hours after posting, so I’m good there, and I assume the axe is from the Chaos Warriors. I have the Scions, so I’ll be able to grab one of those – didn’t know where it came from though – so thank you. Are those Kroot tabards with bones & knife on them? Oh yeah, the axe is a weapon from the WFB Warriors of Chaos. And you’re correct about the tabard as well: It’s from the Kroot kit.